This silky cream enriches your skin and your taste buds, and the rich buttery texture makes your body even more touchable. A Body is a Wonderful Thing to Taste! A unique delightful body creme with skin-softening moisturizers, a rich buttery texture and taste-tempting flavors. 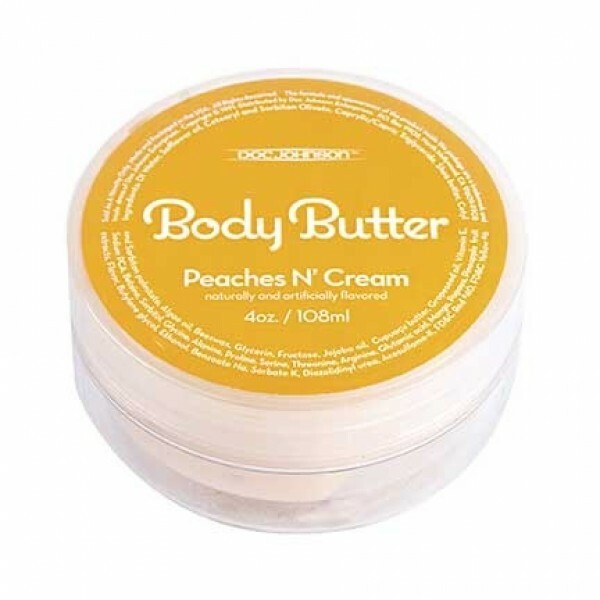 Turn your lover into dessert with Doc Johnson's mouthwatering Body Butter. This silky cream enriches your skin and your taste buds, and the rich buttery texture makes your body even more touchable. You can use Body Butter as a traditional moisturizer or as a massage treat. 4 oz. jar. Available in Peaches n' Cream, Strawberry Shortcake, Wild Cherry, Chocolate Sundae, and Pecan Pie. Water (Aqua), Carthamus Tinctorius (Safflower) Seed Oil, Butyrospermum Parkii (Shea) Butter, Caprylic/Capric Triglyceride, Cetearyl Olivate, Sorbitan Oleate, Glycerin, Vitas Vinifera (Grape) Seed Oil, Beeswax, Flavor (Aroma), Hydrolyzed Corn Starch, Simmondsia Chinesis (Jojoba) Seed Oil, Theobroma Grandiflorum Seed Butter, Laminaria Digitata (Algae) Extract, Cetyl Palmitate, Sorbitan palmitate, Alanine, Arginine, Betaine, Glutamic Acid, Glycine, Lysine, Proline, Serine, Sodium PCA, Sorbitol, Threonine, Tocopheryl Acetate, Mangifera Indica (Mango) Fruit Extract, Carica Papaya (Papaya) Fruit Extract, Ananas Sativus (Pineapple) Fruit Extract, Butylene Glycol, Alcohol Denatured, Potassium Acesulfame, Diazolidinyl Urea, Potassium Sorbate, Sodium Benzoate, Red 40 (CL 16035), Yellow 6 (Cl 15985).